I’m going to be totally honest with you when I say that I have never liked commercial, store bought ketchup. The best way to ruin a perfectly good french fry is to dip it in that sugary, red paste. Gross. Why anyone would actually choose to put ketchup on anything is beyond me. I am my father’s daughter after all making me more of a bleu cheese kind of girl when it comes to dipping fries in things anyways. Now if we’re talking homemade ketchup, that’s an entirely different story. I like being able to customize flavors to my own tastes and I like knowing that there are no added chemical flavorings, coloring, or processed sugars. Rather than tasting one giant blob of sugar tomato, you can actually taste a variety of seasoning that work together to make make the perfect combination of tangy and spice. A lot of ketchup’s also contain traces of garlic and onions in them – which is great! I love garlic and onion in my foods, but when you’re trying to avoid high FODMAP foods – those are your two main culprits for causing stomach upset. I know how disheartening it can be to look up recipes to make only to realize that it’s full of things that you can’t have. So all you IBS’s sufferers out there – I see you. I hear you. 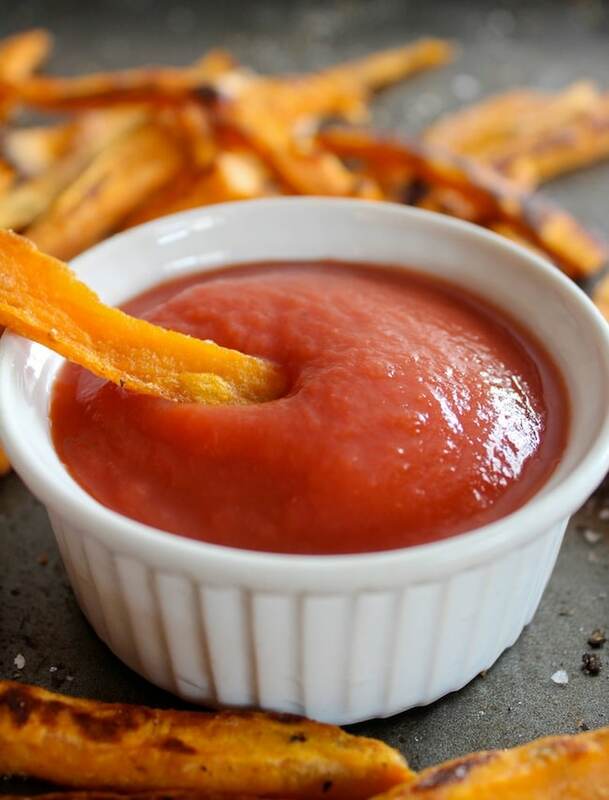 I am totally there for you and this low FODMAP ketchup is made just for you. Part of the reason that I wanted to make a low FODMAP ketchup is because I keep seeing ketchup pop up as an ingredient in different recipes that I want to make -like this sweet & sour chicken. I find that ketchup is just one of those pantry staples that you just just gotta have because when you need it – you need it. Add all of your ingredients to a sauce pan and bring to a simmer. All the sauce to simmer for at least 20 minutes. It will thicken as time goes on. Make sure to stir occasionally to prevent the bottom or sides from burning. When it's done, allow the ketchup to cool completely before storing in an airtight container to keep in the fridge. One of my reader has informed me that the Costco Kirkland brand of organic tomato products are free of onion and garlic, as are Jovial brand products (for smaller portions). This is perfect. Thank you! I’ve been looking for a low sugar ketchup. So glad I found this. I’m about to try it with fresh tomatoes (cooked first) to make the sauce. In Australia we don’t call it ketchup we call it tomato sauce but when I googled that I got recipes for pasta sauces, passata etc. This is very flavorful and pretty much what I’ve been hoping to find low fodmap ketchup recipe wise. I did amend just a bit: I used a 6 oz. can of tomato paste to which I added 1 cup water, replaced half of white vinegar with pineapple juice. (When I was growing up in the early 1960s my dad would only buy a brand of ketchup that had pineapple vinegar in it. I think it might have been Del Monte.) I was inspired to see if it worked for me today. I did add a scant teaspoon white sugar. I also cut back a little on both cumin and allspice. It turned out perfect and now I have ketchup worthy of my burgers and fries. Thanks so much for sharing your gem of a recipe. That’s awesome! I like the sound of the pineapple juice – I bet it adds really nice sweetness. Thanks for letting me know what you thought! 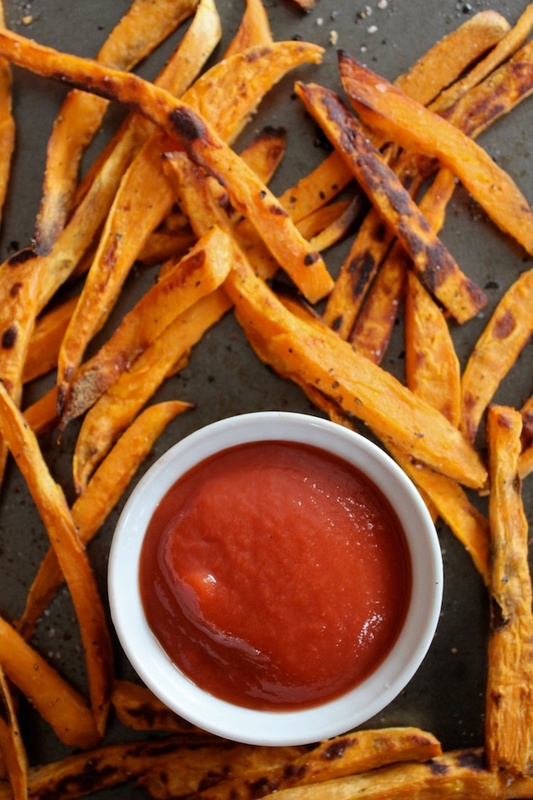 Finally, a good low FODMAP ketchup! Great recipe! 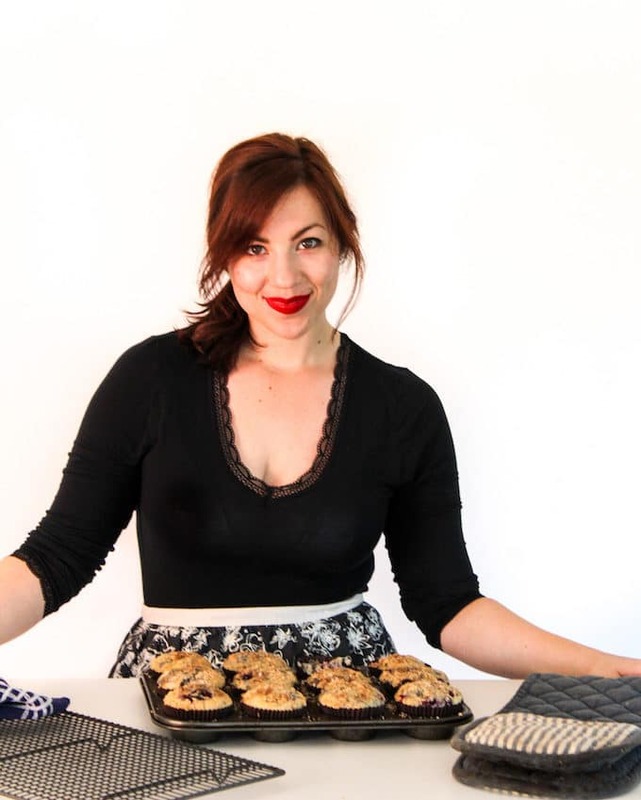 Sarah, I was diagnosed with SIBO and so happy to find your low FODMAP ketchup recipe. I just made it and it’s WAY better than any store bought ketchup! Thank you so much! – oh, and I made it exactly as your recipe states. Yay! I’m so glad you like it! Thanks so much for coming back to let me know what you thought! I there’s something I can use instead of all spice? You can just leave it out if you like! Brand new to the low FODMAP diet and so excited about this recipe…it’s delicious! Thanks! Thanks Natalie! So glad you like it! Thank you for this recipe. I have been frustrated by the lack of products that DONT contain garlic and onion, so I was very excited to try this recipe. It’s fantastic! I added a bit of smoke to change it up a bit. Hi Susan! As someone who used to go crazy trying to find things that didn’t contain onions and garlic I’m so glad you’ve found this helpful! Thank you so much for coming back to leave a comment/ review! This recipe is great. I just put in brown mustard instead of mustard powder and added a tablespoon of hot sauce. Awesome to have ketchup but better!!! I am making this today and I just got a can of the Muir Glen Organic Diced Tomatoes and will put them in my ninja. Problem solved! They didn’t have any onion and garlic. I didn’t even realize most tomato sauces contained onion and garlic. It’s always a good idea to check labels. I have bought the ketchup from Fody Foods but it’s $6.99 a bottle so I am hoping my husband likes this (he isn’t a pikcy person, so I think he will). Thanks for taking your time to share this for so many of us to be able to continue using the sauces we like, even with restrictions. I’ll let you know how we like it. Ooh I hope you both like it! It really is crazy how many things come with all that stuff already in it – I totally get why but it’s frustrating when you’re trying to find things to work with. Thankfully the low fodmap diet is starting to become more mainstream so hopefully you’ll have an easier time finding things going forward. That’s so sweet! I’m so glad you both enjoyed it 🙂 Thanks for coming back to leave a comment/review! I’m gonna add a bay leaf the next time I make this – that sounds like a great idea! So glad to find your site! I am trying this recipe with fingers crossed for my ketchup loving husband who has recently discovered he is gluten intolerant and also cannot eat high fructose foods. I am in Canada and buy Costco’s Kirkland organic tomato sauce but the ingredients list onion powder and garlic powder. I found another product that is only tomatoes and sea salt. Thanks! I hope you guys both like it! Glad I could help – I know how difficult that transition can be! He loved it! Says it is better than the store-bought stuff. 🙂 I am just starting a big batch so I can freeze some. Thanks again for the great recipe! How long does this ketchup last in the fridge? I have made this recipe several times and it is absolutely fabulous! I use Pomi brand strained tomatoes which contains nothing but tomatoes. The first time I made it I used Dijon mustard instead of dried mustard and it tasted great. It freezes very well in a small container or freezer bag. Thanks so much for the recipe. I was unable to find ketchup without garlic or onion, which I can’t tolerate even in small doses, so this recipe has really helped. So happy that you like it! Thanks for the tip on freezing too! We always use it before I have a chance to. Thanks for coming back to leave a comment! This was delicious!! Thank you so much for sharing! I added a little of my garlic infused olive oil to this. Amazing recipe, so yummy! Can’t go wrong there! Glad you liked it! THIS IS AWESOME. I left out the cumin because I’m not a huge fan, but it turned out great! YAAAAY I CAN EAT KETCHUP! Also, for those who are having a hard time finding tomato sauce without garlic or onions, you can dilute 3/4 cup (one small can) of tomato paste with 1 cup water. Tomato paste is usually just tomatoes and citric acid, and it’s easy to find! That’s such a great tip! Thanks, Brenda – so glad you liked it! I suffer from IBS and was sorely missing my ketchup. So I googled and found this recipe. Blimey! It is incredible. Actually the best ketchup I’ve ever tasted. I did take the vinegar down to 1/4 cup, as that’s my personal taste. But I really can’t thank you enough for a fabulous recipe. I recently learned that my tummy does mucb better on a low fodmap diet. As a person who values orvanic, natural foodz and products, I am elated tbat I found your quick and easy recipe. You’re absolutely right about the onion and garlic in ketchup. And, many ketchups include Higb Fructose Corn Syrup, which are all IBS nightmares. I thouvht I would never be able to eat ketchup again..UNTIL TODAY. Thank you, Im ever–grateful. Btw, is there a specific brand of tomato sauce that ypu use? Hi CJ! Finding recipes for IBS issues was such a nightmare when we first started going on a low FODMAP diet – I’m so glad you found this helpful! I use the Sainsbury’s organic tomato sauce here in the UK – it’s nothing but tomato without the skin, salt and a little bit of citric acid. Someone actually just commented the other day saying that she has found Pomi Strained Tomatoes to be a ‘safe’ brand as well. I made a batch of this over the weekend and LOVED IT! It tasted exactly like a better (and spicier) version of the ketchup I was missing. Thank you so much for the recipe! I’m also not a fan of store bought ketchup. It’s overly sweet, sharp, not good at all. I don’t like synthetic tasting products basically. If stored in the refrigerator, how long do you reckon this would last?? Hi Rachel! I very much appreciate the love 🙂 My goal with this blog has always been to help other people who are going through what Mike is/was going through as far as food/gut health goes so it makes me so happy to know that I’m able to do that. As far as the ketchup goes you should be able to keep it store in the fridge for at least a month – ours never last more than a couple of weeks so I can’t say for sure. I was just looking up for homemade ketchup and in general it seems that it should be good for up to 6 months. Hope that helps! Hi! I’ve been making this now for several months and love it! I have since found some “safe” tomato sauce but have also used Pomi Strained Tomatoes (thanks for the tip). I make a large batch and freeze portions since I’m the only one using it. Works fabulous! Thought I’d share this today as I ran out and am making more right now. That’s great! I’m glad you found some tomatoes that worked for you! And thanks for the tip about freezing it – I’ve been asked about that before so that’s really helpful to know. Thanks April! Where do you find tomato sauce that does not contain onion and garlic? I just shopped today looking for sauce and walked out with nothing – even the organic brands. Hmmm, that makes it tough! Can you buy a jar/can of pureed tomatoes? I live in the UK so I bought mine from our local grocery store, Sainsbury’s – it’s just tomato without the skin, salt, and a little bit of citric acid. If you can’t find any at the store you could always try amazon. Most of the time I can’t find specialized ingredients anywhere near where I live, so I usually have to order things from online. Hope that helps! Costco’s Kirkland brand organic canned tomato products don’t contain onions or garlic. If you want a smaller portion, I found Jovial brand at my local food coop. Their gluten free pasta is also amazing. Oh that’s great! I’ll make a note of it in the post for others to see – thanks, AJ! I am so excited to find this recipe! Can not wait to make it! I wanted to ask if this can be canned for future use? 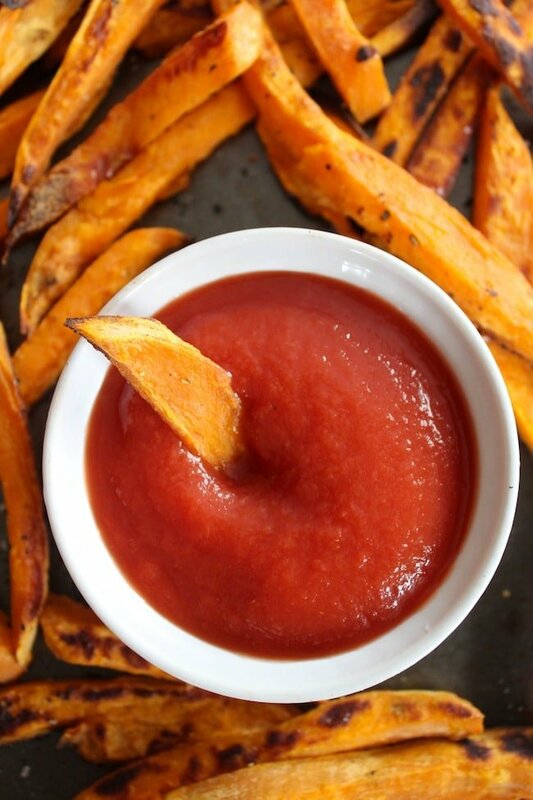 Homemade ketchup sounds so good! I’m not a fan of regular ketchup either…a lot of times I buy gourmet varieties that have ingredient lists that I am more familiar with. I think its time to try making my own now!